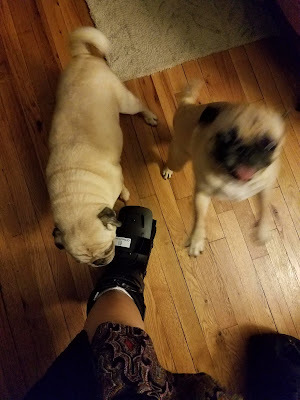 Bah Humpug: I Got The Boot! Okay, let me back up here. So about a week ago, it was raining when I got home from work. I have an old house with front steps that have sunk over the years and so it's a bit of a step up to enter through my front door and I have to do it quick before the storm door behind me crashes against my leg. Sunny and Rosy greeted me enthusiastically, with Rosy especially joyful and leaping at me with her helicopter tail and happy licks. I slipped and stumbled, twisting my ankle. Now, I'm not a doctor going kind of person. Having grown up the daughter of a store owner with minimal health insurance, we didn't go to doctors regularly or for minor things. I also just hate waiting forever in doctor's offices and it's so hard finding good doctors. So, I did what I usually do and shook it off and moved on. 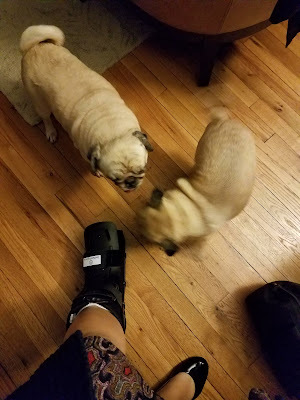 Over the week my ankle continued to hurt, but nothing terrible so I kept limping around. Fast forward to this week, and I'm back to taking the metro (I was driving to work for the most part of the past year) and walking for my commute and my ankle starts to hurt a lot more. Then, I woke up on Thursday and I couldn't put any weight on my left leg. I hobbled to work, thinking I could still power through but everyone noticed and commented on my terrible limp and grimace of pain. So, FINE, I'll go to a doctor! Turns out, I'd fractured it. 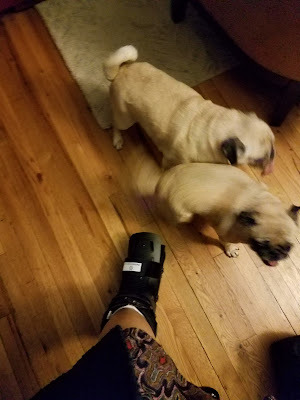 So into the boot my left foot went and will stay for the next few weeks. Ugh. I hate it already. 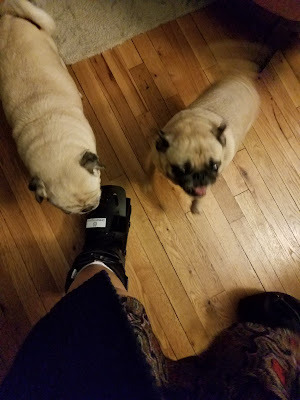 Look at what you helped make happen, pugs! They don't care. They were just happy to see me. Could they be any more lil beans here? 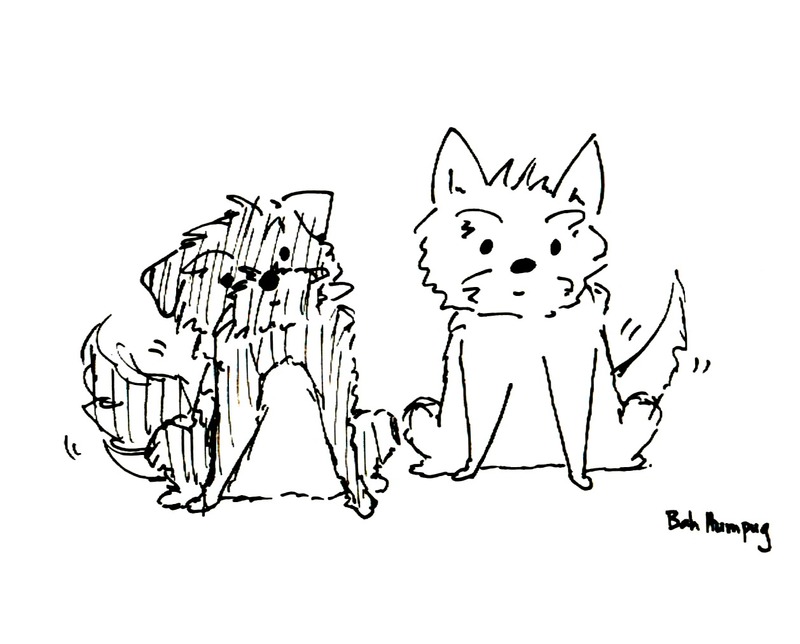 Also, look at Rosy's helicopter tail go! P.S. I am just now noticing that my hair in the drawing totally makes me look like Wolverine. That is all. Oh, and on a random note, I've been outed at my work as the author of this blog and I know that some of my coworkers now visit it. One even went so far as to pressure me for a guest appearance of his own dog. So, below are two of my coworkers' dogs that I met recently. You know who you are. And I know who you are. It is known. Sorry to hear about your leg! I enjoyed reading your blog. It's a constant battle to not trip over our pugs over here too! 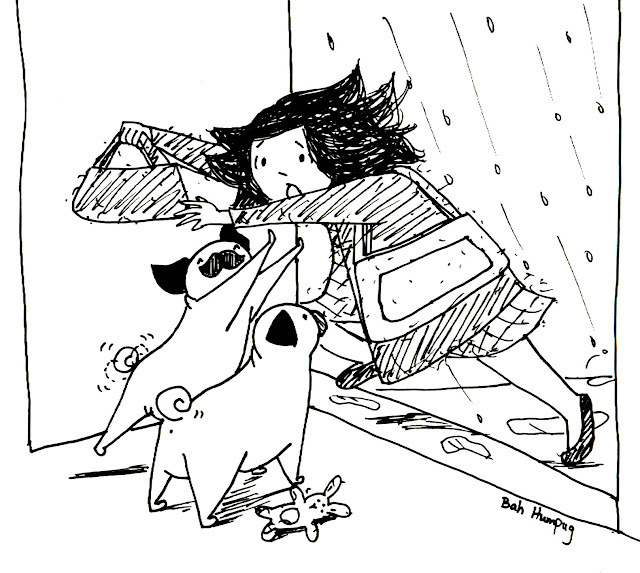 The love pugs give is so worth it though.